Short on time but still want to experience the grandeur and beauty of the Valley of Fire? This small group, half-day tour will take you to the park, allow time for various photo stops and trails. 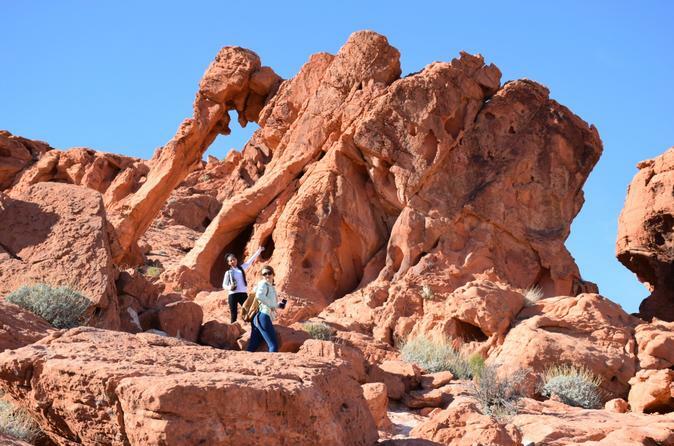 The Valley of Fire has almost 20 miles of roads that take you to various trails and landmarks like Fire Wave, Rainbow Vista, White Domes, Elephant Rock, mouse’s tank and many more, If you are lucky, you may get to see Big Horn Sheep that live in the park! Valley of Fire is an experience you will not forget. You will be in awe of its grandeur and panoramic views! You will feel like you are on an alien planet, which is why it has been the backdrop for many famous movies like Star Trek, Total Recall, and Transformers. There is even remnants of a movie set from a movie filmed in the past. 1-hour scenic drive thru the Mojave Desert to Valley of Fire. Take one of the most popular hikes first, White Domes with its brilliant contrasting colors and movie set remnants and its 1.25 mile scenic trail with a slot canyon. Stop at visitors center to look at exhibits. Drive around and enjoy the beauty of other sites. Last stop in Valley of Fire is the famous “Elephant Rock”. Back to the Strip for hotel drop-off.